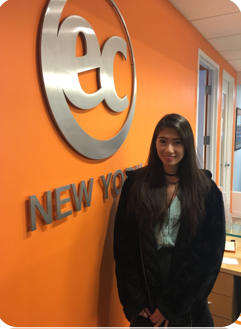 Taiwanese student, Hsin-Yu came to EC New York to improve her English and to increase her job opportunities outside of her country. Here is more information about her EC experience! 1.What do you do in your country? I graduated from a college in my country before I came to NYC. 2.Why do you want to study English? I want to get a job outside of Taiwan. 3.Why do you like about living in New York? My favorite place is a neighborhood in New York called SoHo, which has a good atmosphere and high fashion brands stores! 4.What is your favorite things about EC? EC has many kinds of activities after school and it’s a good way to relax. I tried a lot of different kind of food from several countries. Also I learned a lot about different cultures. 6.What advice would you offer to a new EC student? I would advise them to join the school activities and to make new friends.